My 2nd pregnancy was nothing like my 1st one. I found out at about 5 weeks and it just seemed to last forever! I only gained about 13kg’s, same as the first pregnancy, but that’s about the only thing that was the same. I suffered from morning sickness the first trimester (thank goodness it stopped after the 12th week), migraines, hectic mood swings, horrible swelling, painful tendons, sore joints and crappy heartburn. At the 20 week detailed scan we picked up that Nathan had a VSD (Ventricular Septal Defect) and it was still there at the 30 week detailed scan (see previous posts re the VSD). I also suffered from yeast and bladder infections and at one stage I had to cut out all sugar as I had a glucose intolerance. It definitely was not the smooth, stress free pregnancy I had experienced the first time around. We decided to go with the caesarean option 2nd time around as well because I had to have an emergency Caesar the first time and we eventually booked a date – 4 June 2015. Nathan however had other plans. On Tuesday morning the 19th of May I woke up with cramps that felt very much the same as the “contractions” I had when my water broke with Logan. My water hadn’t broken and there was no spotting / bleeding, however the cramps did not go away so we tried to change my gynae appointment from the Wednesday to that Tuesday just in case. When my gynae heard why I wanted to change the appointment he immediately advised I go to the hospital to be monitored. That made me panic a bit, but Marc calmed me down and off we went to the hospital. It turned out to be false labour, but the cramps and pain was because Nathan had moved down and basically gotten himself ready / engaged. I was immediately told that I could no longer travel long distances or do anything strenuous, therefore I had to take maternity leave earlier than intended and was to do absolutely nothing but relax at home till the 4th of June. I was not too impressed with this as there was so much I still needed to do and it was incredibly frustrating not being able to do anything. I also unfortunately missed out on my cousin’s wedding because I couldn’t travel. I hadn’t done a proper hand over for my colleagues, so my manager arranged to come through to me on Thursday the 28th of May. This however was not to be and I had to once again send my manager a message first thing in the morning to say I was on my way to the hospital and wouldn’t be available. I woke up on the 28th with cramps again, but these were a little more intense than the ones on the 19th. Also, there was some bleeding when I went to the loo so I realised this time was probably the real deal. I calmly let Marc know as I didn’t want to cause a panic and we also needed to get Logan off to school without alarming / exciting him. It just so happened the driver was running late and because of this (even though it was only 5 min late) we got stuck in a bit of traffic on the way to the hospital. Let’s just say that I now know what labour pains feel like. They might not have been full blown labour pains, but they were damn painful none the less. It was not a pleasant drive, but we made it to the hospital without incident. The nurse that helped the last time was a little busy since it was caesarean day (the day all the booked caesarean’s are done) so what I’m assuming was a trainee nurse put me on to the sensors to track Nathan’s heart beat and the contractions. Needless to say she didn’t put the contacts on properly and the machine didn’t pick up any contractions so the nurse didn’t think I was in much pain. When the original nurse finally came back, she thought it rather strange so quickly re arranged the contacts and after one look at the machine charged out the room calling to my gynae that I was in labour and needed to go into theatre immediately! Let’s just say that my definition of immediately and their definition is completely different. I got to the hospital just after 07h00 and was wheeled into the operating room 2 hours later. The anaesthetist did his thing and I started to go numb from the belly button down once again. I was a lot more nervous this time around as I knew what to expect and I couldn’t help, but think of what could go wrong. Between my gynea and the anaesthetist they did a great job of distracting me and Nathan was born at 09h35 (Weight – 3.95kg’s, Length – 50cm’s). My gynea did seem rather surprised though as I had told him my water hadn’t broken yet there was absolutely no fluid left. It had obviously been leaking out without me even knowing about it. Another surprise is that there was a knot in Nathan’s umbilical cord. Apparently the Dr’s don’t get to see that very often and it’s caused by baby doing a somersault manoeuvre in the early stages of pregnancy. It was really cool to see. 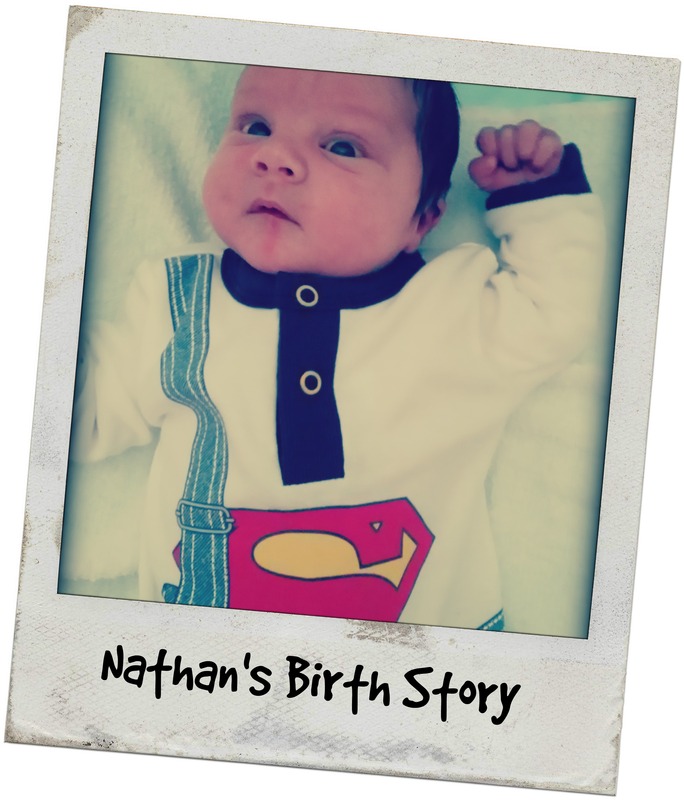 Nathan passed all his checks perfectly and after 2 different paediatricians’ checking neither one could pick up any murmur or signs of a VSD. We will need to have a proper check done at 6 weeks, but for now it appears that the VSD has closed. I also need to mention that the Wednesday, 27 May, Marc had picked up a viral infection so even though he was in the theatre with me, he was not allowed to hold Nathan when he was born or get too close. The first time Marc got to hold Nathan was Sunday, the 31st of May. Congratulations! My L also had a true knot .